The Galaxy Gear might not have been a triumph, but at least a number of Samsung bods have recognised that a rethink is needed for its next smartwatch. Rumours of what the Galaxy Gear 2 may or may not feature have been floating about for months, and the latest we're hearing is that the watch will have a completely new design with a flexible display. How that new design will actually look isn't made clear, but "an industry source" told ZDNet Korea that Samsung is changing up the parts that "looked dull or boring," which hopefully means cutting down that bezel for one thing. The same source also said the Galaxy Gear 2 is likely to be launched in April or March in London. Samsung previously said that the Galaxy S5 would launch at this same time, joined by the new Galaxy Gear. Interestingly, this new tipster also claims that the big unveiling is set to happen in London. Could this be where the S5 is also unveiled? It certainly makes sense for Samsung to bundle the two closely together. 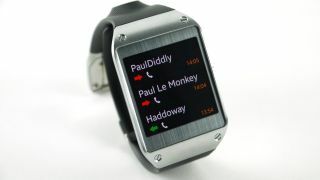 Samsung is reportedly keeping a close eye on what Apple and LG are up to with their own smartwatch efforts. Here's hoping the Korean company has something more appealing by the time the iWatch (probably) rolls around.